A premium quality soap whose name means, ‘it’s good! 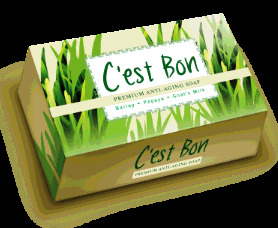 C’est bon is enriched with organic barley grass which helps delay skin aging. It has papaya extract which exerts mild exfoliating and skin-lightening action. Another ingredient is goat’s milk which contains natural lactic acid, a form of alpha-hydroxy-acid which also gently dissolves proteins to exfoliate dead skin cells revealing fresh, younger looking skin underneath.